The Environmental Protection Agency (EPA) must act now to protect communities from a highly toxic class of chemicals known as PFAS (per- and polyfluoroalkyl substances) that contaminate drinking water and groundwater. PFAS are associated with many serious illnesses, including cancers and reproductive disorders. According to documents obtained through a Freedom of Information Act request by the Center for Science and Democracy, the Trump administration tried earlier in 2018 to suppress a government assessment of PFAS health impacts, calling it a "public relations nightmare." The health assessment was released after nearly 18,000 UCS supporters demanded its publication. Now we need federal decisionmakers to take the next step and regulate and clean up this toxic threat. Tip: use talking points from our report and blogs to help shape your letters, and make the issues as local and personal as you can. Military families and communities are at especially high risk. 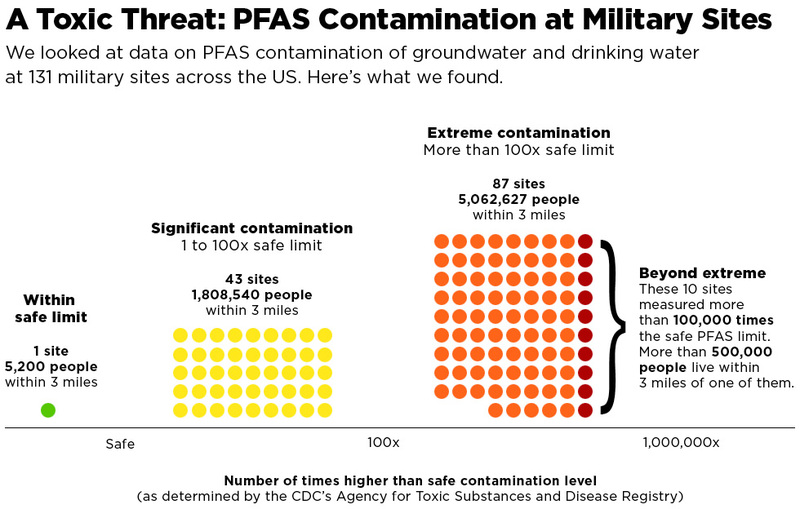 A 2018 UCS analysis of 131 US military facilities showed that nearly all had significant PFAS contamination of groundwater or drinking water, some with levels over 100,000 times the safe limit as determined by the most recent draft scientific assessment from the Department of Health and Human Services. Millions of Americans live within three miles of a contaminated facility. PFAS, also known as highly fluorinated chemicals, are a group of man-made substances used in products ranging from firefighting foam to microwavable popcorn packaging. When released into the environment, PFAS can travel far from their source, which heightens the chance of human exposure through drinking water or food. An analysis by the Environmental Working Group has shown that nearly 100 million Americans may have PFAS in their water.